Bringing together the ERM community to discuss & share techniques and methodologies required to counter the evolving challenges of new governance, operational risk and compliance practices at an enterprise wide level. Globalization and advancement in technology have extended the boundaries within which organizations conduct their businesses. This ever-changing business environment has been witness to various ignominious breakdowns, from natural disasters to corporate frauds and scandals to financial crisis. With growing complexities in business environments, the risk factor increases that much. India is attracting the attention of the international business community faster than ever thus heightening the demand for a robust ERM framework across industries. The level of scrutiny is significant, companies cannot afford to ignore the corporate, reputational and personal risks attached to their business activities. Companies urgently need a new approach to meet the growing challenges of integrating new governance, risk and compliance practices at a global scale. 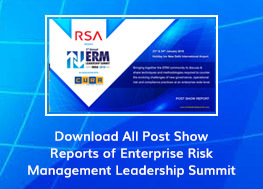 The 4th Annual Enterprise Risk Management Leadership Summit India 2019 is designed to create a platform where the various challenges in Enterprise Risk Management can be brought to light and to address and overcome these challenges in a manner beneficial to all sectors. Get to hear from industry leaders and senior professionals as to what they are doing to efficiently manage their enterprise's risks. Cybersecurity and Digital Risk Management - Why must CIOs prepare and engage?